Strawberry-flavored lemonade drink mix is dissolved in cranberry-apple drink and blended with club soda for a fruity and fizzy summer drink. 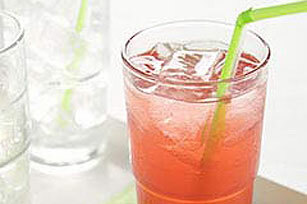 Add cranberry-apple drink to drink mix in 2-qt. plastic or glass pitcher; stir until mix is dissolved. Refrigerate until ready to serve. Serve over ice cubes in 4 tall glasses. Prepare using COUNTRY TIME Lemonade Flavor Drink Mix.